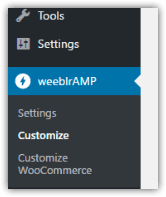 We believe the ability to customize weeblrAMP output of AMP pages is a major requirement of any content generation system, so we have strived to provide you, as a user, or as a web developer, many ways to customize weeblrAMP the way you need. This documentation section will cover the first method, customization through weeblrAMP control panel. The next section, starting here, will cover the other 3 methods. Customization options can be accessed through the Customize weeblrAMP sub-menu. Optionally, and if installed, WooCommerce customization options have their own sub-menu.